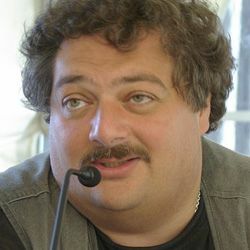 Quick Study: Dmitry Bykov is one of Russia’s most colorful, versatile, and recognizable public intellectuals: Bykov writes poetry, fiction, biographies, and criticism, and is a co-founder of the Citizen Poet project, which showcases his satirical political poetry. The Bykov File: Bykov’s biography of Boris Pasternak won the 2006 National Bestseller and Big Book awards; he won the National Bestseller again in 2011 for Ostromov, or the Sorcerer’s Apprentice, a novel about Freemasons in Leningrad during the 1920s that was also shortlisted for the 2011 Big Book, where it won prizes from the jury and readers. When he’s not writing poems, novels, and biographies, Bykov serves as creative editor of the newspaper Sobesednik and often appears on television and radio, where he has hosted numerous programs, including the talk show “The City Show with Dmitry Bykov” on Siti-FM. Bykov’s Places: Moscow. Radio and TV airwaves throughout Russia. On Writing: Bykov has said he’s a writer because, as someone in the humanities (and as someone lacking math skills), he doesn’t see any purpose in doing anything else. He thinks journalism is especially gratifying because articles can bring immediate results. Bykov Recommends: Bykov told a group of students in November 2011 that he thinks the best books written are: Charles De Coster’s The Legend of Thyl Ulenspiegel and Lamme Goedzak, St. Augustine’s Confessions, Alexander Zhitinsky’s Lost House, Lev Tolstoy’s Anna Karenina, and Marina Tsvetaeva’s The Tale of Sonechka. Bykov also listed contemporary Russian writers he thinks are talented, including Sergei Lukyanenko, Evgeny Lukin, Mikhail Uspensky, Ksenia Buksha, Andrei Lazarchuk, and Roman Senchin, though he doesn’t have a favorite writer whose books he eagerly awaits. Other favorites include G.K. Chesterton, Agatha Christie, Truman Capote, and Mark Danielewski’s House of Leaves. Anthologies: Prose in War & Peace (Glas, 2006, tr. Francis Greene, “Christ’s Coming”) and poetry in Contemporary Russian Poetry: An Anthology (Dalkey Archive Press, 2008, tr. Matvei Yankelevich).